Download "SRL Networks Presents Sam & Nate" on the SRL Record Store. A fresh breath to the musical air, Sam and Nate have had melody embedded in their lives since birth. With a background in piano, guitar, bass and drums, Sam & Nate have cultivated an understanding musically that has no further explanation than brotherhood. Samuel leads the two in melody with Nate’s purposeful unique rap style that demands attention. 2008 led them to winning multiple talent competitions, most notably AMTC. 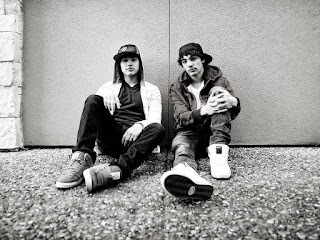 In 2009, the two found ultimate focus, seeking to take their musical endeavors to the next level. They began writing, rehearsing and performing on stages. Their first recording took place in a closet; the second was done in Dallas, Texas with acclaimed record producer Geoff Rockwell. The summer of 2011 brought their musical talents to their “Camplified Tour” on the East Coast performing before thousands of screaming campers. They shared the stage with Savvy, who recently were signed to Cash Money Records label. Sam & Nate continue to perform as often as possible, and in December were invited to Disney’s Celebration City, to perform at “Celebration of Voices” sharing their talent with everyone in the snow covered streets. They have been working and recording in Atlanta, Georgia with John Eley. Their new single, “Fell In Love with Love”, featuring Algee is stirring up much interest in the music industry and is getting a lot of air play. Listen out for Fell In Love With Love and other good songs by Sam & Nate on Skunk Radio Live Pop Playlist Shows.